This is going to be mentioned ad nauseam around the blogosphere (once the bloggers get their affiliate links of course – no wonder why it is quiet thus far this morning) so I’ll make this quick but the offer on the Starwood American Express card has increased to 30,000 Starpoints after spending $3,000 3 months. This is the highest public offer on this card – in fact this probably the best ever offer on the card as this is the first time the 30,000 point bonus is offered with the lowered $3k spend requirement. I wrote a popular PSA post back in May advising to NOT apply for the Starwood American Express at that time when a big deal was made about the spending requirement dropping from $5k to $3k for two major reasons. American Express limits an individual to only one signup bonus on personal cards in their lifetime. As such, it is imperative to only apply for a personal Amex card when the offer is at its peak. I told my readers that based on the history of the Starwood 30k offer, it would return sometime this summer. If you could wait a few months from when I posted in May, you would be able get an offer that was 20% better. I don’t mean to toot my own horn but my advice was spot on. Now is the time to signup for the Starwood card if you don’t have it already as this offer is at an all time high and I don’t see foresee this offer ever getting better. SPG points are among the most valuable (if not most valuable) points out there as these 30,000 points could easily cover a few nights in Starwood hotels or the points could be transferred to many different airlines at a great ratio. This increased offer is valid through September 14th. If you would like to support the blog and my efforts as a non-affiliate links blogger, I can refer others for the Starwood card as I am a current cardholder. 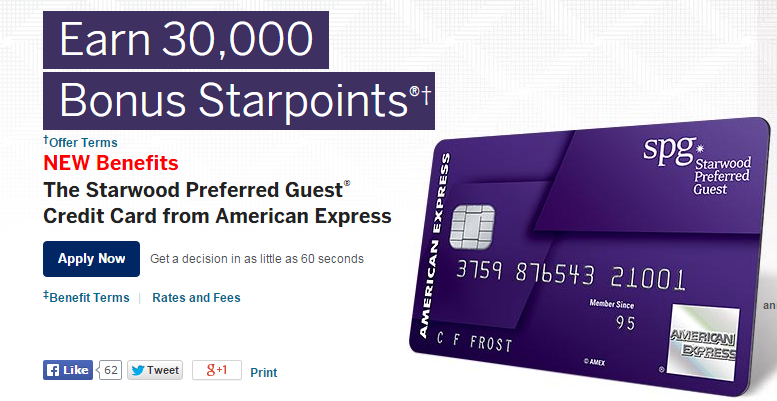 I do receive 5,000 Starpoints for referring you but you will receive the same 30,000 point offer via email from American Express. If you are interested, please leave a comment asking for a referral (only I will be able to see your email address) or email me directly at ralph@pointscentric.com and I will promptly refer you for the card. Thank you in advance for your support! Just sent! You should see an email from Amex with link to apply. Thanks for your support! Unfortunately I do not. Sorry! Saw the offer and thought about your post. Very good. Also got Amex prg for 50k and $1000 spend. Now see that there are other offers with 100k points. Always something better outside. What? Are there 100k offers for the PRG? What? There is a 100k offer for the PRG out ther? I thought the 50k was a targetted one. Is there a more targetted one out there? Hi sounds good, please send! Just sent. You should see an email from Amex with a link to apply. Thanks again for your support! Please send me a referral for the 30,000 mile Starwood offer. Best Regards. Just sent. You should see an email from Amex with a link to apply. Thank you for your support! Sent! Thanks for your support – you should see an email from Amex with link to apply shortly. Let me know if I should do this one! 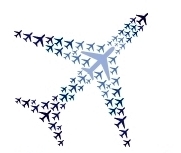 U said it does transfer to other airlines? Is there a yearly fee? If u think I should, send me the referral please. Thanks Ralph! Did anyone else notice that their Cardmember Agreement still states the old annual fee of $65, even with the date in the top-right corner of 8/12/15? I saved my electronic version when I noticed the error after applying and being approved; when I received my card in the mail this week my hard-copy agreement also stated $65. Win! I have few referrals available for Amex SPG Personal card ( 30,000 points after $3k spend in 3 months). Please email me on mayuriajit@gmail.com and I can send you referral.